You are entitled to 2 free ‘Your Call’ clean-up collections plus 1 free scheduled collection each calendar year. To book your clean-up, call customer service at 9083 8000. Identify other options to reuse, donate or recycle your items if they are still in good condition, as all items presented in a clean-up collection go to landfill. Review our list below of acceptable items for the bulky household goods clean-up service. Call Customer Service at 9083 8000 to make your booking. If booking spaces are available you may book a bulky household goods collection up to 1pm the day before your garbage collection day. If no bookings are available, or it is later than 1pm, your booking will be scheduled for the next available collection day. Residents are encouraged to book their collection as early as possible to secure a collection booking on their preferred day. If you do not present your waste correctly, and within the guidelines we provide, your collection may be rejected and you will be responsible for the cost of clean-up. Ensure you only present large, bulky household items for collection. Small items should go in your general waste bin. Place your clean-up material on the kerbside the night before your booked collection day in a tidy pile that doesn’t block roadways or footpaths. If your items are put out too early, passers-by may add to the pile, and the entire pile may be considered illegal dumping and rejected by our cleansing crew. Remove doors from fridges and other appliances. Be sure to box or bag your items for easy removal. 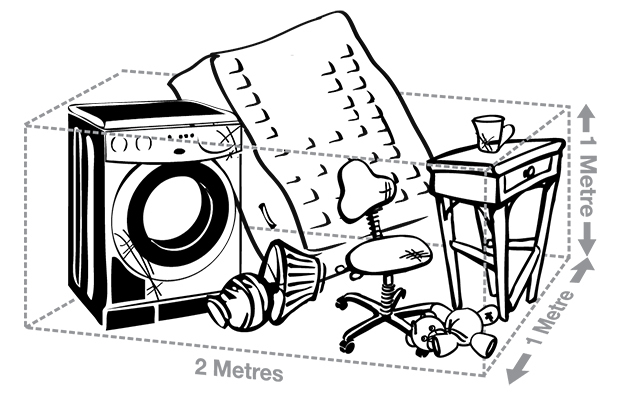 Make sure that your pile of items is no more than 2 cubic metres (one trailer load). See graphic below. Ensure that bulky garden organics are bundled and cut into one-metre lengths. Due to Work Health and Safety reasons, there are some items that we are not able to collect in clean-up collections as they require special handling to be disposed of or recycled safely. Drop off at your next free local e-waste drop off event or visit the Waverley Library or Customer Service Centre to drop of mobile phones, batteries and ink cartridges. Other hazardous materials Contact Household Chemical Cleanout on 131 555 or find your nearest Community Recycling Centre. Large pieces of glass or mirror (greater than 100cm by 100cm) Find a private waste contractor to collect and dispose of this item. Large doors (greater than a standard single door) Find a private waste contractor to collect and dispose of this item. (as this creates a litter issue when this item is compacted in the truck) Find a private waste contractor to collect and dispose of this item. 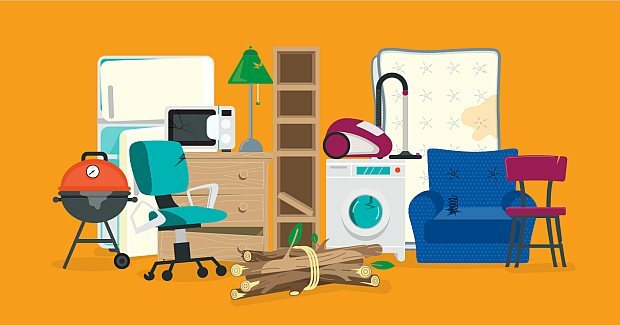 What happens to items collected in clean-up collection? Booked clean-up collections are offered by Waverley Council as a strategy to reduce the cost and pollution associated with illegal dumping, and are not designed to recover resources. We are unfortunately unable to recycle, repair or reuse any materials collected in booked clean-up collections at this time. All materials collected in the clean-up service will go to landfill. Before booking a clean-up, have you considered other ways to re-purpose your unwanted items? Refer to the list below to help you discover ways to easily keep items that are still in good condition out of landfill. Garage sales or clothing swaps are a great way to re-home items you are finished with and make a little extra pocket money. Win-win! Advertise your own, or register for the annual Garage Sale Trail. Advertise your items on your local ‘Buy Swap Sell’ group or on Facebook’s “Marketplace”. You can also post an advert on sites like Gumtree or eBay. These are great avenues to give away or sell your items, and listings are usually at no cost to you. Check out local repair services near you. Often an item just needs a bit of tender loving care or the skill of an expert to be good returned to good as new. The Bower Reuse and Repair Centre often hosts repair cafes. Ask a friend or family member if they want the item. Post your item as free in online community swap groups. St Vincent de Paul store accept donations, mostly of clothing, but also other household items. The one located at Spring St, Bondi Junction allows donations at the store during working hours. Find your closest Vinnies Shop by typing your suburb in here. The Smith Family have donation bins and retail stores around town where you can donate your unwanted clothing items that are still in good condition. The Bower offers a free collection for second hand items that are still in good condition such as furniture, appliances, household goods, salvaged building materials, bikes, books and more. Learn how to donate here. The Bondi Toy Library accepts donations of used toys in excellent condition. No soft toys or books please. Learn more here. Soft Landings will collect mattresses for recycling for a small fee. Learn more here. Boomerang bags makes reusable shopping bags from donated textiles. Find your nearest chapter online. If you’re unable to repurpose, repair or recycle your unwanted item, call customer service 9083 8000 to book in your clean-up collection. For more information, or for any further questions, please contact Customer Service on 9083 8000.